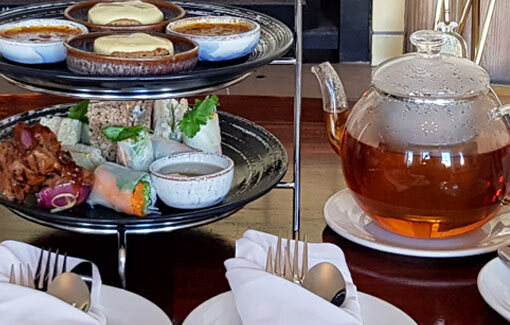 Our High Tea is a truly decadent affair. Think savoury bites such as Smoked salmon trout, dill & cream cheese sandwiches, and Monkeygland Glazed beef & red onion mini skewers; and Coconut sesame butter macarons and fruit tartlets as sweet treats – not to forget freshly baked Scones of course. All are served with the finest selection of teas or coffee, as well as MCC or Champagne on request. Whether you are celebrating an engagement or baby shower, birthday or bar mitzvah, or a corporate function, we can tailor the event to your needs, and offer the perfect venue for your do – be it at the Bluewing with 180 degrees sea view, our restaurant terrace, or the intimate Summer Lounge.